Archbishop Hieronymus Herculanus Bumbun, O.F.M. Cap., Archbishop of Pontianak (Indonesia) was in Medjugorje on May 13 and 14, 2005. He came on a pilgrimage with a group from Jakarta. Archbishop Hieronymus Herculanus Bumbun said that he came to Medjugorje because of his devotion to the Blessed Virgin Mary. He is very impressed by the message of Medjugorje given to the 6 visionaries. He thinks that it is good for people to follow these messages, because they lead to peace, hope and faith. He sees them as a basic catholic education for the families. He says that it would be good for the families to pay more attention to these messages. In his diocese of Pontianak in Indonesia, they increase the community spirit. The messages of Medjugorje can be very well applied to the living philosophy in Indonesia. They are closely related to the life of the people and the Church. In the present globalisation of the world, which is affecting the relationships in the family, these messages can help the family to feel as the basic cell of the Church. About his impressions here, Archbishop Hieronymus Herculanus Bumbun said that he is very touched by the openhearted way in which people offer hospitality to the pilgrims in Medjugorje. What they say is not exaggerated, there is no promotion; it is simple and real. About the prayer in the church, he said that is easy to see the strong spiritual life. He is impressed, he praises the Lord for the possibility to be here and to see with his eyes and to hear with his ears. Mons. Salvatore Boccaccio, bishop of the diocese Frosinone near Rome, was on a private pilgrimage in Medjugorje from June 4 to 7, 2005. During his stay, he visited the places of prayer and participated in the liturgical and prayer programme in the parish church. He also met the Medjugorje Franciscans. Asked about the reasons for his pilgrimage to Medjugorje, he said: “In my diocese, I have young people who were converted and whose life was changed in Medjugorje. Their witness was for me a sign of a great presence of God in Medjugorje. I also read what Rene Laurentin wrote about Our Lady’s apparitions, and it also had an influence, but most of all, I was inspired by personal witnesses of the pilgrims. I congratulate the Franciscans who are tirelessly serving the pilgrims and patiently and humbly supporting all attacks and provocations”, said the Mons. Salvatore Boccaccio, visibly filled with joy because of his coming to Medjugorje. Mons. Geevarghese Mar Divannasios Ottathengil (54), Indian catholic bishop of Syro-Malankara rite, bishop of the diocese Bathery from Kerala (India), was on pilgrimage in Medjugorje at the occasion of the 24th anniversary of the apparitions. He came to Medjugorje with a group of 25 pilgrims from Switzerland. “I heard about Medjugorje for the first time about 15-20 years ago, but I was doubting. I was not very much interested in coming here, but a friend of mine, a priest from Switzerland, told me about Medjugorje and about his experience. His attitude as a priest had tremendously changed after Medjugorje. He was praying well, and in his relationship with others, he became very human. He is a real priest now! That made me think: There must be something in Medjugorje?! Roman Gruether told me that Medjugorje was different from other places of pilgrimages, that the natural atmosphere is kept, and that people are really praying here. Last year, I made up my mind to come and see. I came now with a group from Switzerland led by Sylvia Keller. My experience is corresponding to my expectations. These 3 days are a confirmation. One can feel the family spirit here. People who are involved in the service, even the smallest service, do it with love and with joy. This place gives us also the experience of the universal family. Everyone feels here at home, like in one’s mothers house. I met the visionaries; I visited Marija, Ivan and Vicka. I think that they are real visionaries. Medjugorje will be recognised, there is no doubt! Today or tomorrow, maybe little later, 100% sure it will be recognised! These messages are really needed. Prayer, Holy Mass, penance, confession, fasting, conversion. At any age, they are the fundamentals of spiritual life. Without Jesus, there is no spiritual life. Self-denial, living for God and for others. Often, we are tempted to think that, at the modern age, we are competing with God. But we have to realise that human beings are limited. Catastrophes help us understand our limits. September 11th, or Tsunami… we understand how small we are. Medjugorje is for our time a real call from God. The people who live here are fortunate. You have a special vocation. You have to keep this universal brotherhood. This is not only for this parish, this region, this diocese… It is for the whole world. You have to promote this universal spirit. Mons. Domenico Pecile, Bishop Emeritus of Latina, at present vicar of St John in Lateran Basilica in Rome, came on a private pilgrimage to Medjugorje in August 2005. “I heard about Medjugorje for the first time at the very beginning of Our Lady’s apparitions. From the very beginning, I was interested in these events in a positive way. In general, concerning this kind of events, my personal attitude is always to come and see personally, to observe the event. This is how, some years after the beginning of the apparitions in Medjugorje, I came here with two other persons. I introduced myself as a bishop only to the pastor of Medjugorje. I was concelebrating together with other priests, as one of them. This first visit to Medjugorje remained engraved in my heart. Something within me was telling me that it was impossible that these events were not authentic. I had the chance to come back two years ago. In the history of the Church, Our Lady has intervened many times because she loves humanity, and because God himself is sending her, in order to remind us of His love. I felt deep within, especially during my second visit two years ago, precisely this: the love of God! Jesus Christ is the one who is sending Our Lady. Jesus, whom she calls her Son. Sometimes, I feel like saying to the Lord: “Oh, Lord, do come yourself to us!” But He is sending Our Lady. I a certain way, we are more open and more ready to accept her. We feel less distant from her, because she is not only our Mother, but also our Sister. Because of my responsibility as a bishop of the Catholic Church, I have come personally to see if this event is real, if it is acceptable. From the very first time that I came to Medjugorje, my conviction is that these events are authentic. Medjugorje is a reality. I see it as a place that has received a great gift. Our Lady is coming here, as she came to many other places, and maybe in the future she will be coming somewhere else. It is neither strange nor weird that Our Lady is appearing. She is always appearing in order to help us to come back to God. This time, here in Medjugorje, Our Lady is coming in a very powerful way, an outstanding way, different then her other comings. It is impossible not to see here the Lord our God. Impossible! I come here to pray to Our Lady, to feel her presence, not only because I feel the need for it, but because this is giving me a consolation on the road, a strength to continue, to walk with one additional reason, with the conviction that God truly loves us all. Gradually, I came to know all the visionaries. My impression is that these persons have received a great gift, but they do not display it. They are simple, ordinary people like anyone else. You have to talk to them in order to realise that they have received a special grace, and this is what I like so much. When I came for the first time to Medjugorje, I met Jakov, the youngest among them. I spoke with him in the garden, next to his house. I saw this simple young man, I asked him some questions and he answered me. Someone could maybe say that he is without any higher education, but I say the contrary: he was very precise in his answers, confessing his faith and keeping in his heart the gift that he has received, without displaying it in any particular way. I had the same impression, every time I met one of them. They speak with great clarity. They have great gifts in their hearts. It is impossible for us to even imagine what is in their hearts, in their lives, and everything is so simple. According to my opinion, precisely this is the strongest thing. I have the impression that God wants them to fulfil the mission that He is asking from them, without displaying it outwardly. They are our brothers, people like any one of us, and they do not display the special gift that God has given only to them. They simply feel as carriers of a message, a message that they also need themselves. This is how I see them. When we read the messages, we can discern if they can help us, if they are in harmony with the Catholic teaching of the Catholic Church. Here, this is perfect! The messages are simple, so that everyone can understand them, and they are perfectly in accord with the truth of the Gospel and the teaching of the Church. Pilgrims that are coming to Medjugorje are not coming for a visit, but to encounter Our Lady who is speaking to them through her messages. Our Lady is speaking to their hearts, if they are open to listen in prayer. If you pray here, if you come here in silence and you try to understand your life, if you pray and deepen your Christian life, something great and good for the humanity is happening. These days, I was in a great joy. I was glorifying God! I especially enjoyed hearing confessions. In Medjugorje, hearing confessions is an extraordinary experience. Something special is happening here, it is different then elsewhere. Penitents are aware of their sins. They are aware of the fact that sin is the real evil of the world, and it is not so easy to come to this understanding. This is one of the most beautiful fruits of Medjugorje. In Eucharistic celebrations, I saw something extraordinary: pilgrims were attentive, concentrated, although we had Holy Mass in a conference hall. Nothing could distract them; they experienced something deep within them. The presence of the mystery can almost be felt in the air here. The faithful come to the churches elsewhere also, but you see them talking. But not here! Here, they are attentive! In all our churches throughout the world, it should be as it is here in Medjugorje. Mons. José Luís Azcona Hermoso, O.A.R., a religious of the Augustinian Order, born in Spain in Pamplona, bishop of the diocese Marajó, which is a mission area in Brazil, was on a private pilgrimage in Medjugorje for the Feast of the Nativity of Mary. Mons. Bruno Tommasi, retired archbishop of the archdiocese of Lucca (Italy), came for his second private pilgrimage to Medjugorje in September 2005. Mons Tommasi visited the Shrine and the places of prayer, and spent hours in the confessional, hearing confessions of the Italian pilgrims. “Several years ago, I met a priest and some laymen that had gone to Medjugorje and who were internally transformed, converted. I was impressed. If a place is able to transform, to convert people, that means that this is a place of grace. Last year, I had the occasion to come here with two priests that accompanied me this year also. Then I had the occasion to know Marija, and this year I met Vicka. Although for the moment there is no official position of the authority on the authenticity of these apparitions, thanks to the encounter with these persons, I am convinced that they do not lie, that they are sincere and that they have a true experience of grace. To those who ask me questions about Medjugorje, I say that this is a place of prayer, a place where people are converted. The rest must wait that responsible authorities of the Church pronounce their judgement. I think that for the moment Medjugorje has become a shrine. I see no behaviour or reflection in contrast with faith. This is a path of way, of prayer, of penitence. The choice of the Holy Virgin to appear here, in the context and in the time of communism, is a special event. It is really appropriate that she appears here and not in a place where liberty reigns. I think that one can consider Medjugorje as an impulse for the renewal of the Church. This is a renewal that comes from below, through changes in persons. The fact that so many go for confession here is very positive. In the western countries, many go for communion, but very few go for confession. One could say that the sense of sin got lost, and therefore also the need to go for confession. Mons. Issam John Darwish, BSO, DD., eparch of the Melkite Catholic Church of Australia and New Zealand, was on a private pilgrimage in Medjugorje from September 12 to 19, 2005. In Medjugorje, he celebrated the 33rd anniversary of his priestly ordination. “Last Sunday, I was in Castel Gandolfo with my group of pilgrims, and we prayed the Angelus with the Pope. After the Angelus, as it was arranged before, I went to visit the Holy Father. The program of this visit was specified in advance. At the end of our conversation, I asked the Holy Father to give his blessing to the group of pilgrims, which was going to Medjugorje the following day. If you have ever met the Pope, you know that he has a splendid smile. He smiled with great kindness and he said: ‘May God watch over you and bless you’. The devotion towards the Virgin Mary is very widespread among our parishioners. They came to me and they asked me to accompany them this year to Medjugorje. I have much work, but I accepted immediately. Then, I thought that I should have perhaps said no, but now I am glad to have come. With the group, we contemplate each day the life of Mary from the beginning to the cross. For me, it is a Marian retreat. I wanted to transmit to the faithful what our Byzantine Church is saying on Mary. All the prayers were directed towards a better knowledge of the role of Mary in our life. For me and for the whole group, the coming here is a blessing. We see Mary as a person who leads us to Jesus. She plays an important role in our life. She is leading us to Jesus and she is deepening our faith. The number of pilgrims coming to Medjugorje is a sign of God. The atmosphere of prayer spread by the priests from here is very deep. I believe that Medjugorje is a place of expectation, a place that is questioning our faith: how to deepen our faith? The prayer in front of the cross, adoration, the Eucharist - all this gives to the pilgrims a deep spirituality. It is a place of prayer. I think that the role of the priest who accompanies the pilgrims is very important. In order to bring fruits, the pilgrims must be accompanied by a priest. His role is to help them to go further than seeking signs. I said to my pilgrims that we have already the signs: it is the Blessed Sacrament of the altar and other sacraments. All the sacraments should be lived: sacrament of penance, the Eucharist; their spiritual role should be discovered. The Mother of God speaks to each one of us. It is not necessary to see her. We can see her with our interior eyes, the eyes of faith. I think that the priests from here are giving to the pilgrims a very good orientation, but the priests who accompany the pilgrims should pay more attention to the teaching of the Church. The priests from here could give the priests who accompany the pilgrims some directions: how to live the interior conversion in a deeper way. And let us allow the Lord to act in the hearts of the faithful! Some people need feelings, others don’t. This is Christian life. The messages of Medjugorje are messages of the Gospel. I do not see anything else. Eucharist, penance, prayer... it is the Gospel. The apparitions? I do not know. I do not have any clear idea, but I think that God can do all that He wants. I will write a booklet on my impressions of Medjugorje. I will encourage the faithful to come to make this pilgrimage, to live a few days of prayer and interior conversion. I will encourage them. I also will encourage the priests to come with them. Mons. José Domingo Ulloa Mendieta, O.S.A., auxiliary bishop of the Archdiocese of Panama, was in Medjugorje in September 2005. He came on a private pilgrimage with 17 pilgrims. “A priest with whom I was in the Seminary, Fr. Francisco Verar, spoke to me about Medjugorje long ago. Now, the time has come for me to see for myself. What I have experienced here goes far beyond my expectations. The encounter with so many pilgrims is an excellent experience. I can see their desire to convert and to change. For me, it is also important to notice the social activity practised here in Medjugorje. It articulates what Mary is doing, namely to be always ready to help others. My pilgrims were prepared for this pilgrimage. Medjugorje amazes them, and they will remain under the influence of seeing so many people coming here to pray. The spirituality inspired by Medjugorje is very developed in my country. We especially want to involve children. The Parish church consecrated to “Mary, Queen of Peace”, founded by Fr. 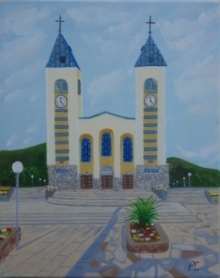 Francisco Verar, was built according to the model of St. James’ church in Medjugorje. In Panama, there are many prayer groups based on Our Lady’s messages. The simplicity of these messages is enticing. The Medjugorje messages are an evangelic call to conversion and to peace; there is nothing apocalyptic in them. Without prayer, without fasting and without the Eucharist – and these are the foundations of Christianity – we cannot answer the call to holiness addressed to us by Mary. Those who come to Medjugorje want to answer the evangelical call that is coming from the Lord, especially by means of the Eucharist and the sacrament of Confession. I have heard from many people that they experience the need to change, and to change within the Church and through the sacraments. One cannot leave Medjugorje without this burning desire to change and to start anew. Many groups are coming accompanied by their priests who help them, and this generates the beginning of a new life for them. Initially people feel the need to experience something. Human curiosity is natural, but the atmosphere created within the group day after day, during the pilgrimage, is helpful; the initial desire diminishes and another desire awakens: the need to know oneself and to achieve an inner transformation. The greatest miracle is the spiritual healing that people experience here. The specificity of Medjugorje is the gift of peace received here. This is what humanity is longing for today, and this gift is received in Medjugorje through our Mother Mary. It is not only about inner peace, but also about discovering that we are all brothers, and that conflicts and violence are not a solution. This peace should be shared with others. All of the visionaries of Medjugorje are married, they have families, and I am very glad about this, because this means, that the call to holiness is for all. The family path is a way of holiness; holiness is not only for priests and for religious. God is calling all men. Christians are invited to give witness, to live in the world without belonging to the world. We are called to be witnesses of joy. We cannot keep silent about what we have seen and we cannot ignore what Our Lady is asking. In Medjugorje, pilgrims find peace, they encounter Jesus, and their lives change. Towards all those who are like the lost sheep, we have to be like Jesus, so that people can come back to Him and receive from Him all the good that He is giving. Let us be like Mary, let us see what people need, what their sufferings are, and let us help them. Let us be witnesses of the great gift of living our faith within our Holy Mother Church. Mons. Stanislas Lukumwena Lumbala, O.F.M., bishop of the diocese of Kole in the Democratic Republic of Congo, came for the second time on a private pilgrimage to Medjugorje in September 2005. He came alone to Medjugorje, for a few days of personal prayer and spiritual renewal. He spent long hours hearing confessions in French and in Italian. "I came to Medjugorje to seek interior peace. A bishop in Africa is a builder; he is repairing the roads, constructing bridges, building schools. A bishop is doing everything, and there are moments when he really needs spiritual refreshment. This is why I came here, to withdraw for a few days, to pray together with the pilgrims. What seems to me very good here is that I can hear confessions. Yesterday, I spent four hours in the confessional. In my diocese, I do not have often the occasion to hear confessions. It is splendid to see how many people come for confession here. I am very much attracted by this. In recent times, the Church is insisting a great deal on the sacrament of the Eucharist and on the sacrament of reconciliation. Here, we find precisely these two fundamental sacraments. At the beginning, much was spoken about the apparitions, and now more and more about spirituality. A great spirituality is developing here. The message was given, the message of peace and conversion, and now it has to be lived. People like whatever is sensational. Whenever somebody speaks about messages and visionaries, people are running. Now, less and less is spoken about apparitions, and it is going increasingly into depth. People need a solid spiritual support. The interior life must be based on solid evangelic values. This is why I am saying that the deepening of the message, hence prayer, Eucharist and confession, are the basis for the deepening of the spiritual life of the person. I speak about Medjugorje on a purely private basis. I am the bishop of another diocese, and I do not want to speak about things, which do not concern me. I am coming because of my personal devotion. We should not worry about the recognition. The recognition will surely come. Bishops are coming; they come to pray. There is something here, which attracts us, which impresses us. Little by little, Medjugorje will be recognized. Let each one live his devotion. In the diocese of Kole, we are preparing the launching of a Radio station, which will be a new possibility to make Medjugorje better known." Mons. Michael Pearse Lacey, retired auxiliary bishop of Toronto, was on his fourth private pilgrimage in Medjugorje from October 9 to 17, 2005. He came with a group of pilgrims from Canada. He was following the usual program for pilgrims, and was hearing confessions. On Friday, November 4, four bishops came to the Shrine of the Queen of Peace in Medjugorje. Mons. Thomas Msusa, actual bishop of the diocese of Zomba, his retired predecessor Mons. Allan Chamgwera, and Mons. Remi Joseph Gustave Saint-Marie, bishop of Dedza, came from Malawi. Mons. Joseph Faber MacDonald, bishop of the diocese Saint John in New Brunswick, came from Canada. All four bishops have a positive opinion about Medjugorje, and they are glad to be in this worldly renowned Our Lady’s shrine. At the presbytery, they met the pastor, dr. Fr. Ivan Sesar, and other Franciscans from Medjugorje. They especially underlined the importance of Medjugorje as the largest confessional of the world. (about the construction of a Medjugorje Shrine in Malawi) Everything started under the direction of the Peace Centre in Malawi, when they began to speak about the spirituality of Medjugorje. The idea was to give to the Malawians something similar. Then, there was a phone call from Great Britain. A very wealthy businessman, who wanted to do this first in his own country, was looking for a similar landscape to that in Medjugorje, but he could not find it. Then he found such a place in Malawi, and he proposed a donation for the launching of the works. We understood that Our Lady wanted us to have such a place in our own country. We then went to ask for permission from our archbishop, which he granted, because he had a positive attitude towards Medjugorje.